In terms of type, the global CBRN security market has been segmented into chemical, biological, radiological, and nuclear security. The nuclear segment, among these, is the most attractive segment with the segment holding 33.8% of the overall market in 2016. Demand for nuclear security segment is rising globally at a very high pace due to congressional mandates and international laws that restrict the use of nuclear weapons. Additionally, the segment of chemical security is gaining importance among military and law enforcement agencies due to evidence of procurement of chemical agents by terrorist organizations to develop weapons of mass destruction. By function, the global CBRN security market is segmented into protection, detection, decontamination, and simulation. The protection segment in CBRN security market held the leading share of 33.6% in 2016. The leading share of the segment is due to increasing military expenditures. Detection segment stood as the second-leading segment in the market in the same year. The geographical segments into which the global CBRN security market is divided are North America, Asia Pacific, Europe, the Middle East and Africa, and Latin America. North America stood as the leading regional segment in 2016 and is expected to retain supremacy over the forecast period between 2017 and 2025. The increasing threat of terrorist attacks and the rising applications of radiopharmaceuticals in medical treatments are boosting the demand for CBRN security systems in North America. However, Asia Pacific is expected to rise at the leading CAGR of 5.4% between 2017 and 2025. Increasing defense budgets that includes adoption of CBRN security systems is one of the key factors boosting growth of this regional market. Key players in the global CBRN security market include Survitec Group, Tingley Rubber Corporation, W.L. Gore & Associates Inc., MKU GmbH, Blücher GmBH, 3M Company, Respirex International Ltd, Alaska Structures, Honeywell International Inc., and ILC Dover, Argon Elecronics Ltd, FLIR Systems Inc., HDT Global, AirBoss Defense Inc., MSA Safety Inc., General Dynamics Corporation, Bruker Corporation, Thales Group, and Kärcher Futuretech GmbH among others. Chemical, biological, radiological and nuclear (CBRN) security is principally responsible for effective combat against CBRN weapons for mass destruction from various external or internal anti national organizations. CBRN incidents can occur accidentally, intentionally, or naturally. Accidental CBRN incidents are the events caused by human error or technological errors, such as factory spillage, accidental release or leakage of poisonous gas or liquids. Intentional CBRN incidents are those that occur when CBRN materials are released into the environment with the intention of terrorism or war. The deliberate accumulation or discharge of hazardous materials to avoid fulfilling regulatory requirements also counts as intentional CBRN incidents. A natural CBRN incident would be the outbreak of an infectious disease such as Ebola, swine flu, severe acute respiratory syndrome (S.A.R.S. ), pandemic influenza, etc. Owing to the global increase in terrorist activity and the procurement of mass destruction weapons by anti-state organizations, it has become highly essential for governments, armed troops and civilians to be involved in a strategic recognition, preparation, and prevention of fatal threats. Governments across the world are adopting enhanced technology for the prevention of CBRN attacks by anti-national or terrorist organizations. For example, the recent evidence of the procurement of chemical weapons for mass destruction by the Islamic State of Iraq and Syria (ISIS), Boko Haram, and Al-Qaeda, signifies a major threat to the international community. Military organizations across the world are demanding special devices, systems and training for CBRN attack response operations. 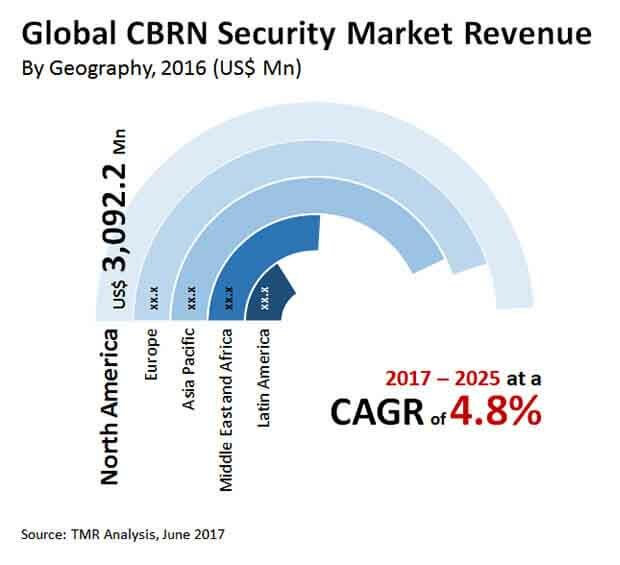 Increase in the terrorist activities across the world is one of the key factor driving the demand of CBRN security market during the forecast period of 2017 – 2025. In December 2016, 145 terrorist incidents were reported. Several countries across the globe the invested in defense for adopt enhanced technology for the prevention of CBRN attacks by anti-national or terrorist organizations. For Instance, the recent evidence of the procurement of chemical weapons for mass destruction by the Islamic State of Iraq and Syria (ISIS), Boko Haram, and Al-Qaeda, signifies a major threat to the international community. According to Central Intelligence Agency, Al-Qa'ida and other terrorist groups have a lots of agents to choose from for chemical, biological, radiological, or nuclear (CBRN) attack. Due to this factor, government of different countries are modernizing their defense and buying new equipment for CBRN security. Additionally, growing unfavorable geopolitical issues between countries also indicate potential threat of CBRN attacks. Repetitive clashes between Russia and Ukraine, India and Pakistan, China and Taiwan, and Saudi Arabia and Iran are a few of the geopolitical issues at present. On the other hand, the economic crisis in Europe has also given rise to various political conflicts among the European nations lately. These unfavorable geopolitical issues also pose threat of CBRN attacks and can affect national economy and security. Growing need for early detection of CBRN incidents and immediate response for protection are the primary concerns for governments worldwide. Owing to these factors, the demand for CBRN security is increasing at a substantial pace globally. The impact of the threat from terrorists and unfavorable geopolitical issues is currently high and is expected to reduce to medium over the forecast period. Based on the type, the global CBRN security market has been segmented into chemical, biological, radiological and nuclear security. In 2016, among various types, nuclear segment is expected to dominate the market followed by chemical. Based on the function, the global CBRN security market has been segmented into protection, detection, decontamination and simulation. In 2016, among various functions, protection segment is expected to dominate the market followed by detection. By geography, the market has been segmented into North America, Europe, Asia Pacific Middle East and Africa and Latin America. Based on the type, the market has been categorized into chemical, biological, radiological and nuclear security. Additionally, the market has been segmented on the basis of functions which include protection equipment, detection equipment, decontamination equipment and simulation equipment. The market size and forecast from 2017 to 2025 have been provided in the report. Key players profiled in this report include Survitec Group (United Kingdom), Tingley Rubber Corporation (United States), W. L. Gore & Associates, Inc (United States), MKU GmbH (United States), Blücher GmbH (Germany) and Supergum International (Israel) for CBRN boots. AVON Protection Systems, Inc (United States), Scott Safety (United States), 3M Company (United States), AVEC CHEM s.r.o (CZECH REPUBLIC) and Respirex International Ltd (United Kingdom) for CBRN filters. HDT Global (United States), Alaska Structures (United States) and Air Shelter USA, LLC (United States) for CBRN shelters. W. L. Gore & Associates, Inc (United States), Blücher GmbH (Germany), Paul Boyé Technology SAS (France), Supergum International (Israel) and Dharma Magna (Indonesia) for CBRN fabric gloves. Honeywell International Inc. (United States), Survitec Group (United Kingdom), Respirex International Ltd (United Kingdom), ISOVAC Product LLC (United States) and GOETZLOFF GmbH (Austria) for CBRN ISOPOD. AVON Protection Systems, Inc (United States), Drägerwerk AG & Co. KGaA (Germany), 3M Company (United States), Honeywell International Inc (United States), ILC Dover (United States) and Micronel Safety USA, LLC (United States) for CBRN PAPR. AVON Protection Systems, Inc (United States), Scott Safety (United States), Shalon-Chemical Industries (Israel), MSA (United States), Drägerwerk AG & Co. KGaA (Germany) and Supergum International (Israel) for CBRN mask. Honeywell International Inc (United States), REX-Gummitechniken GmbH Co.KG (Germany), Ansell Ltd (Australia) and Guardian Manufacturing (United States) for CBRN rubber gloves.